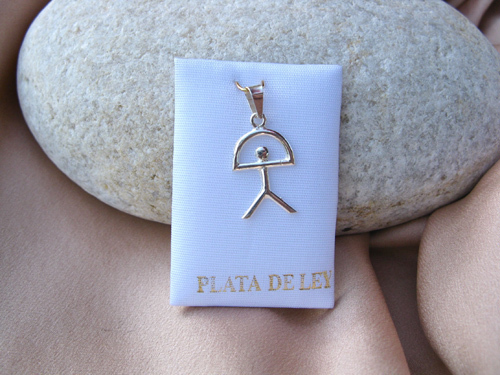 This small classic-style sterling silver pendant features the lucky Indalo, known around the world but especially in southern Spain, as a symbol of protection and good fortune. People who are lucky think positively, look for opportunities and are always open to possibilities. Remind your friends or loved ones to be lucky and positive by sending this pretty and meaningful present. It is the ideal gift for any special event or occasion or to show someone you are thinking about them. Dimensions: Pendant measures 24mm in total length including the hanging bail. (Height from top of arch to bottom of legs 15mm x 11mm wide, flat back). Other sizes available, see picture. Please note that no chain is included (although we can supply chains separately).